So who are the teams we should be picking against? There are a bunch this year! 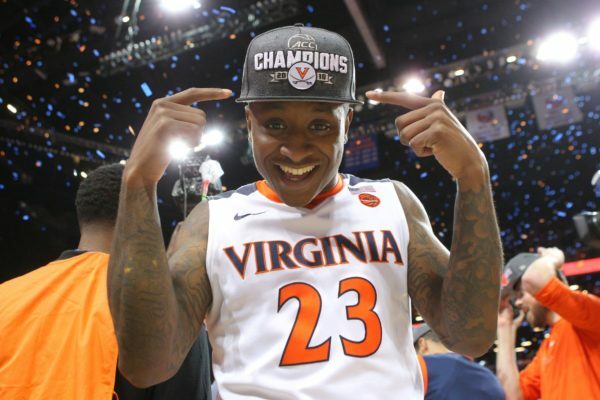 Virginia, Michigan, Tennessee, Texas Tech, West Virginia, Ohio State, Auburn, Clemson, Houston and Nevada all have the honor of being final Top 25 teams that were unranked in the preseason. They have exceeded expectations all season long, but they are statistically more likely to regress to the mean over the next two weeks. Here are the caveats. Virginia, for all of its glory this season, is the first #1 overall seed to have come into the season unranked in recent memory, and they were just outside the Top 25 (27th, to be precise). 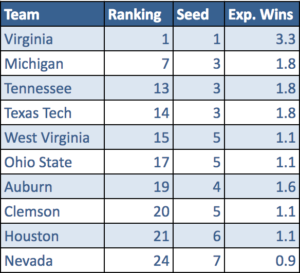 To that point, do not infer this data to mean that every one of these teams will exit early — the conclusion is rather that the group as a whole will underperform versus their seed. March is upon us, and it is all-consuming. But, as recent history shows, we should still be considering November in our picks. This entry was posted on Wednesday, March 14th, 2018 at 8:01 am by Will Ezekowitz	and is filed under 2018 ncaa tournament, bracket prep, feature. Tagged: auburn, clemson, houston, michigan wolverines, nevada, ohio state, tennessee, texas tech, Virginia Cavaliers, west virginia. You can follow any responses to this entry through the RSS 2.0 feed. You can leave a response, or trackback from your own site.